I don’t think this is from this show, because that’s the doubleneck. If you are a listener of my podcast you already know that in September of 1983, the ARMS Concerts were held in London. They featured sets from Eric Clapton, Jeff Beck, and Jimmy Page. This show, from May of that year, is the first live appearance of Jimmy Page since he jammed (along with Robert Plant), with Foreigner on May 12, 1982. 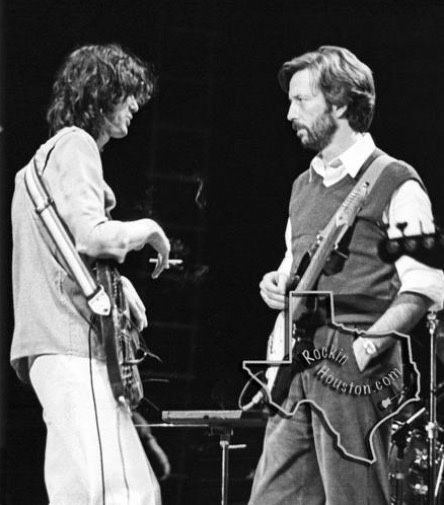 This Eric Clapton concert was the last show of the Money and Cigarettes tour, and it took place in the UK, at the Guildford Town Hall. After performing his set, Eric brought out some friends for a bit of a jam. Albert Lee was playing in Clapton’s band, but Jimmy Page, Phil Collins (who was just about the biggest star in the world in 1983), and Chas & Dave, came out to play. Irish singer Paul Brady comes out to close out the proceedings with Goodnight Irene. It’s a fun set. Jimmy is, as you probably know having followed my podcasts, not in the best shape here, but he’s not as bad as I had recalled. This YouTube recording is better than the bootleg I’ve had for years. There’s a lot more definition and clarity here, and it does Jimmy credit. One thing that’s delightful is that this isn’t just one song. It’s a nice set. You’ll be able tell which guitar is Jimmy’s because he’s using his b-bender telecaster, and nothing else sounds like that. It’s a delightful artifact of Jimmy’s career post-Zeppelin, but before the Firm was even an idea. This show is also just before Eric Clapton’s career had its resurgence with Forever Man. I hope you enjoy this.